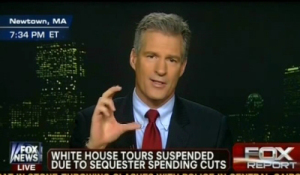 I’ll leave it to my friend John Carroll to analyze the dust-up between the Boston Globe and the Boston Herald over whether former senator Scott Brown is or isn’t still working for Fox News. (Short answer: he is.) No doubt that’s coming later today. So just a quick observation. On Wednesday the Globe’s Joshua Miller quoted an unnamed source at Fox who told him that Brown was “out of contract,” thus fueling speculation that Brown was about to jump into New Hampshire’s U.S. Senate race. It turns out, according to the Herald’s Hillary Chabot and Miller’s follow-up report, that Brown was merely between contracts, and that he’s now re-upped.